Emmai Alaquiva overcame hard times to develop a successful career as an Emmy Award-winning film director, composer and mentor. Knowing his involvement in philanthropic projects, his favorite thing to do with kids comes as no surprise. The Ross Township family – wife, educator Patrice Alaquiva, and daughter, Makayla, 7 – volunteer together. They assemble Homeless Care Kits, volunteer at the Pittsburgh Food Bank and at their church, among other organizations. “Two areas of service that mean the most to me are homelessness and youth arts. Homelessness, because it affected me directly,” says Emmai, 42, who experienced homelessness as a young man for a year and a half. His Hip-Hop on L.O.C.K. is a great example of promoting creativity in kids. The award-winning arts education program uses the foundations of hip-hop to empower youth. The program now has 48 partnerships in 11 regional school districts. Today, Emmai is CEO of Ya Momz House, Inc., an award-winning multimedia company, director for CBS Sports Network’s “Game Changers,” and he’s worked on celebrity projects with the likes of Oprah Winfrey, Wiz Khalifa and the late Maya Angelou. 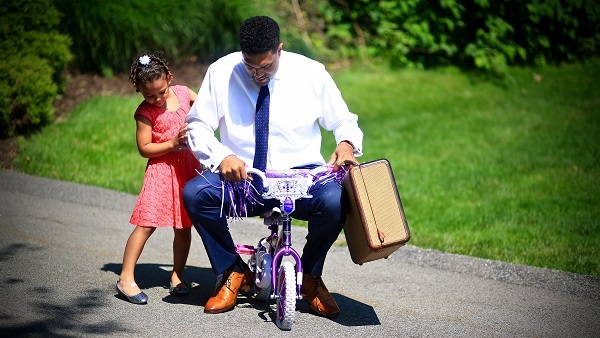 Makayla gives her dad a turn on her bicycle. But even with all the career acclaim, it’s the basics that keep Emmai focused and down-to-earth.